All the strength you need to achieve anything is within you. Don’t wait for a light to appear at the end of the tunnel, stride down there and light the damn thing yourself! We can learn so much from animals; they give very clear signals without saying a word. May the veil of greed, ignorance and selfishness be lifted to reveal our true nature, which is in essence spiritual. Modern technology is a wonderful thing if used for the betterment of humankind. Let us not get lost in the superficial material world because there are greater miracles, Mother Earth and humanity. As usual I have been extremely blessed with many beautiful experiences including; receiving from Bud Johnson (The President of ‘The Keepers Of The Sacred Tradition Of Pipemakers’) some calendars with some amazing examples of the art of pipe carving in them. I feel I will soon be making an order for some more pipe stone for some people. The bigger the order the cheaper it is for everyone, so let me know as soon as possible (yesterday ha ha). Firstly I would like to thank all those people who have shared their lives with me lately. I am finding more and more people who are softly treading the true path of spirit in a humble way that is harmonious with Mother Earth and the world of matter. As Louis Armstrong said, it truly is a wonderful world. And for those called by spirit and recently arrived on the path, welcome aboard, we are all equal here, eagerly awaiting the reunion of Earth People. Sometimes, I find it very difficult to know where my outer life ends and my inner life begins. This may seem a strange comment to make, but in fact these pairs of opposites are so intertwined for all of us spirits, that possess a physical body, that many people interpret their life based on their outer physical life and are totally neglecting or denying their inner spiritual life, which is the eternal part. This eternal part sees the big picture of life and evolution, like the eagle that soars and glides high in the sky seeing all that moves. The message of the eagle is to stay in touch with our spirit, soul or inner self and make all our decisions with the big picture in mind. This may sound easy, but in fact it is hard, because we cannot effect any physical changes from this vantage point. Like the eagle that cannot catch his prey from up high, he must come down to where the prey is on the ground. So too, we must come into the physical realm to live life, however, like the eagle we must move back to the big picture to see if our actions in the physical world of detail has achieved the desired effect. The biggest problem, especially for those who deny their inner life, is getting caught in the small picture of detailed physical existence, with the who did what to whom, where and when, that led to a particular reaction, feeling, desire, or fear. So we must always stay with the big picture to make all our decisions and only go into the detail to catch our prey and then return to the big picture to see if we have our prey in our claws, or it is still down in the detail. When I explained this to someone lately, after understanding it, they agreed and said that that sounds like a good explanation of our soul seeing the big picture and then coming into birth on earth to learn and grow. But more often than not we getting caught in the detail of the physical life and don’t seeing the big picture of why we exist and why we came here. The Native Americans, Indians as some people call them, refer to the Red Road, being the road of good actions, thoughts and ceremonies. This Good Red Road, which was spoken of by Raven Wi in Volume 1 Number 2, runs between the north and the south; but the Black Road, the road that we must acknowledge as existing but try to stay off, runs between the east and the west. Therefore the two roads cross and intertwine, just as all paths between all pairs of opposites do. So the dilemma that we all face is to find the middle way and stay there, but the world keeps on moving and changing so that sometimes we don’t know which way is up and which way is down. And the Red Road sometimes looks like the Black Road and visa versa. This, I think, is why I sometimes get confused as to which is my inner life and which is my outer life. I don’t know why I rambled on in this way. I really wanted to say something a bit more personal from my heart rather than my mind, but as usual for me I ended up giving another lecture. I’m sorry but I hope it helps to see that I am just like everyone else, full of faults. From: ‘Touch the Earth – A Self-Portrait of Indian Existence’ Compiled By: T.C. McLuhan. Tatanka–Ohitika, or Brave Buffalo, a Sioux [Lakota] Indian, was a prominent medicine man of the Standing Rock Reservation, as had been his father. Tatanka-Ohitika was born near the present site of Pollock, North Dakota, and at the age of 73, in 1911, he described his dream of the sacred stone. “When I was ten years of age I looked at the land and the rivers, the sky above, and the animals around me and could not fail to realise that they were made by some great power. I was so anxious to understand this power that I questioned the trees and the bushes. It seemed as though the flowers were staring at me, and I wanted to ask them “Who made you?” I looked at the moss-covered stones; some of them seemed to have the features of a man, but they could not answer me. Then I had a dream, and in my dream one of these small round stones appeared to me and told me that the maker of all was Wakan Tanka, and that in order to honour him I must honour his works in nature. The stone said that by my search I had shown myself worthy of supernatural help. It said that if I were curing a sick person I might ask its assistance, and that all the forces of nature would help me work a cure. "It is significant that certain stones are not found buried in the earth, but are on top of high butts. They are round, like the sun and moon, and we know that all things, which are round, are related to each other. Things, which are alike in their nature, grow to look like each other, and these stones have lain there a long time, looking at the sun. Many pebbles and stones have been shaped in the current of a stream, but these stones were found far from the water and have been exposed only to the sun and the wind. The earth contains many thousand such stones hidden beneath its surface. The thunderbird is said to be related to these stones, and when a man or an animal is to be punished, the thunderbird strikes the person, and if it were possible to follow the course of the lightning, one of these stones would be found embedded in the earth. Some believe that these stones descended with the lightning, but I believe they are on the ground and are projected downward by the bolt. In all my life I have been faithful to the sacred stones. I have lived according to their requirements, and they have helped me in all my troubles. I have tried to qualify myself as well as possible to handle these sacred stones, yet I know that I am not worthy to speak to Wakan Tanka. I make my request of the stones and they are my intercessors." “They replied that two things are of utmost importance. First, people must know that crystals are torn away from their natural home and from their cluster families so that we might have them. Many of the means used to mine them are violent and shattering. Thus, when a crystal comes to us, it is vitally important that we do a healing ceremony, to ease the distress of the crystal, And that we do a ceremony of adoption as well, so the crystal is once more part of a family. "Secondly, remembering that these crystals have made enormous sacrifices in order for us to have them, we must pledge that we will use them in service of All Our Relations [all things]. Too often, the crystals reminded me, people have them for show, or to be groovy, or to simply decorate themselves with ‘jewels'. The crystals objected mightily to this kind of use, after all they have gone through, and considering what they are capable of… The wishes of the crystals are not being honoured." “The lesson of crystals is a lesson for us all in owning and developing the abilities we possess within ourselves. It echoes the teaching of White Buffalo Calf Pipe Woman as she urges us to claim our own holiness, to awaken the limitless spirit that lives within each of us, just as it lives in the stone people and in All Our Relations. Sometimes I think we have invented such things as computers, with their amazing abilities, in order to remind ourselves that the brain is an even finer tool. Our challenge is to not get lost in objects outside ourselves, but to use them as reminders to explore and expand our knowledge of what Spirit gave us that we may not yet have developed. We can then begin to see ourselves as the *Hologram I believe we are. Not only the challenges, but the joys and powers of life, can be owned in a good way, as we come to know this greater oneness and unity of all life." *The Hologram is the picture of the universe, where every tiny part of the picture is also a miniature picture of the whole universe. It is referred to by the Western Upanishad Indians as the ‘Net of Gems’, where each gem reflects all the other gems, indicating that every being is part of, and therefore responsible for all other beings. 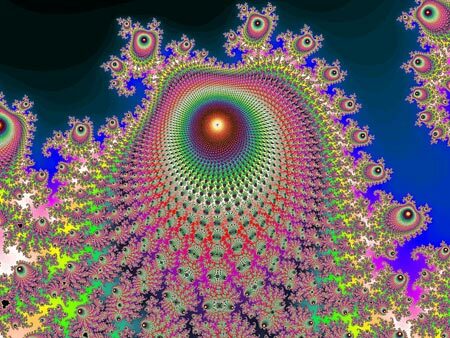 The following pictures from the Mandelbrot set is a good example. WITNESSED SIGNIFICANCE is what I spoke about in my article 'Initiations and Vision Quests'. It is the need to be seen, known, responded to, confirmed, appreciated, cared for, mirrored, recognised, and identified; and this need is universal and mythologically based. CALLING has two steps to it; firstly the calling to your life’s task (Dharma) or duty as an inner command from God, and secondly the acceptance of the call, even if it is socially unpopular. Psychologically, this brings in the concept of identity. The author here sheds light on the dilemma of divine uniqueness of the individual verses the sense of divine duty (Dharma) as a separation from uniqueness, the self that is identical in everyone. A person’s career may be their calling, but generally career prominence has nothing to do with calling. Every man’s foremost task is the actualisation of his unique, unprecedented and never-returning potentialities. Fear must be faced and put in its place, “to avoid fear is to avoid living” – from sacrifice comes bliss, but love bears all tings. SACRIFICE; along with human love are the important subjects that I have been working on for some time, under the heading ‘Sacrifice and bliss’ and ‘Suffering and Compassion’. MEANINGFUL DEATH is about living life to the fullest potential and being prepared to transcend it. Quoting Stephen Levine, a student of Elizabeth Kubler-Ross (see ‘The Wheel of Life’ Vol.1 no.2): “Our fear of death is directly equatable to our fear of life… whatever prepares you for death enhances life… focusing on death is a way of becoming fully alive.” Death is the symbol of loss, transformation and transcendence. Every second dies with the birth of a new second. “Release and love… always awaken proximity to death.” Robert J. Lifton has said: “Every significant step in human existence involves some inner sense of death.” Awareness of death leads one to search for the eternal, undying spirit of God living within each and every manifestation of life. Ranga Whatumanawa – Relating to the emotions. An important part of development is related to emotions. There is a time and place for every emotion. Express rather than repress emotions. Every emotion has both a negative and positive side to it. Positive – anger at the effect of negative statements. Negative – anger at the person who made the negative statements. Positive – being proud of your cultural identity. Negative – being too proud to apologise for hurting someone. The kinship network as far as the extended family (tribal group in this context) is concerned, is what gives a feeling of belonging, value and security. Knowing one’s genealogical ties is important. We must find our truths and speak them. and tell them to hold tight to our sacredness. cleansing her of dark sadness. spread it on eagles wings. There are times when you will have less vision, and because of that dimness you will become unbalanced in your seeing; you will see everything, every stone, every machine, every tree, as dead rather than alive. As your vision grows, sit still within the city, and begin to develop and to see that stones and plants and even machines are alive. Even the dead trees have passed through the gateway in the west. Their spirit carries the Dreaming Shield. Begin to see the life within every object. Begin to see the sacredness of things, their energy, their colours, their luminous forms, their shadow beings. Then you will become strong. See power all around you; it is you. You have developed true vision. It is about knowledge, about the juxtaposition of ancient and current symbols that live within us all. Here sits Vajra Satva, a perfected being, representing the east direction with thunderbolts in both hands, symbolising the power of God within each of us. This being stands tall in centeredness, as we all strive to do. Do not be distracted by the surrounding buildings of commerce, but rather stay centred in your vision of sacredness, and rise above the ordinary pain of life. Mahi-a rongo – Peaceful pursuits eg: arts and crafts. Peaceful pursuits of arts, crafts, song, and dance, play an important part in healing of the heart, mind, spirit and psyche. Take time out to feel the magic. From the day that I became a man onward, whenever I would go hunting, I would use every part of the animal and waste nothing given to me. The secret is to always put back something when you take something from Mother Earth, then you will always enjoy good hunting. My hunting these days is to try to repair some of the damage done by the first settlers in Australia. I hunt only feral cats, foxes and pigs, which were brought here by the white men, and they don’t belong. These animals have done massive damage to native animals over the years, and I do enjoy cleaning them up. Every cat or fox I kill gives that many more native birds a chance to survive. I hunt with bow and arrow, and no spot light, so that I must still use the bush as my cover, therefore still giving these creatures a chance to escape, and also perfecting my own bush skills to maximise success. For those people who feel that hunting is a crime, I do apologise, but you must remember that it was only a hundred years or so ago that all men had to hunt to survive. I do look forward to the Golden Age when I can have a zoo with as many animals as I care to have, and I will keep my promise to the buck that made me a man. I will have a large deer farm, and I will feed and look after them as friends. I will gladly give up eating meat in those days and I will love and care for these creatures that share our life and love of Mother Earth. To know the spirit of the creatures on earth is to know the spirit of the universe. As you walk through the forest, you will see that all the creatures run away from man. This is because they know the spirit of man, they know that he is the most dangerous animal in the forest. Their fear of us is one of nature. They only trust you if you have shown, over many months, that you mean them no harm. The trust, which is formed with another creature, is the thread of the universe, it shows us that the Great Spirit is alive and well, and living here with us on planet earth. We can learn so much from nature, if only we would listen. Just recently my little girl, aged five, said to me, “When I see an eagle, it’s like he can speak to me inside.” It made me realise that the connection that the Indians have always had with nature is alive and well, and no matter what happens to this planet, the children of the Golden Age will find that peace of mind and love of one another that we have forgotten. As with all generations, our hopes rest in our children. So we must make sure that our children love and respect nature. It is not here for us to rule over, or use for our own materialistic benefit, it is here because it is part of us and we are part of it. We must take our kids out of the city and introduce them to nature, and show them that the city only exists because we took it from nature. The trees are our houses; the sand, gravel and rocks are our roads, and the animals and plants are the foods that we eat, and that with out these things we would not survive. It is important for our kids to understand that we are part of the great circle of life, and not here to destroy and rule everything. Our scientists are now counting the cost of mankind’s destructive nature. They know that with every animal that becomes extinct many more are endangered. All creatures depend on each other for survival, and man must realise that he is in the same boat. I know that Mother Earth can heal the many wounds that we have inflicted upon her, but we must try to curb our destructive nature now, and begin to help her heal. We can stop the use of dangerous chemicals and clean up the land we walk on. Many people are trying to do this, but it will take all of us working together to make a difference. Just because the world is heading for great destructive times does not mean we should give up. In fact, we should try all the harder to mend the damage we have done so that the earth will heal quicker and be less destructive. Once we put the earth and nature back in balance, the Golden Age will begin. I just hope that the fires of mankind don’t burn too long, and we have enough land, forest, water, and animals to start all over again. Bringing back the balance will help. The one thing my Grandfather said to me that is more relevant today than ever, is simply, “Nothing in the past is as important as the future.” He said this talking about the way the Indians were treated in the past, and he meant that what happened in the past was gone, and we should turn our attention to the future, because it was of more importance to all people. No matter what has happened in the past, every day is a new day and anything can be fixed or made better in the future. So even though our rivers are full of algae and chemicals now, we can easily make a difference by starting now. To the Indians there is no such thing as no hope. We can always change our ways to become a better race of people. The world is bereft of feminine consciousness. To bring Mother Earth back into balance, we must bring back our awareness of her. Language is a barrier between us, but woman has always communed with women in an unspoken language. Her roots are entwined with the essence of Mother Earth, for she too is feminine. A woman is the Keeper of the Planet and must not let her energy be re-rooted by the male systems within woman or man. We are all in need of world harmony. Mother Earth has been misunderstood, but she is the universe. She is the womb for all that lives. Feminine consciousness is the energy that embodies the wisdom you need at this moment. It is in the direction of the west, through the transformation of an overbalance of male energies, that we will reinstate the harmony and balance on earth, with feminine consciousness. The feminine spirit as exemplified by the trees of women, trees in a grove of sisterhood, of women in communication. This grove of female trees shows its connectedness and harmony with the universal consciousness within the earth below. The butterflies represent the Chakra system of energy throughout the human being, which relates to universal energies that are born from sacred space and provide a growing evolution toward the light. Funny as it may seem, but as a male I can only say, that I agree totally. Our emotions generally come from the ‘body-mind’, ‘cellular-memory’, subconscious or unconscious. They live in the north of the Medicine Wheel, so they need to be balanced with the rational knowledge of the conscious mind, in the south. As Lynn Andrews has explained many times, that in this current society, women generally live in the north, of their emotions, and men generally live in the south, of the mind. She says that the couple may meet in the physical, the west, for an occasional encounter, which may or may not bring them the ecstatic experience of being one with spirit, in the east. But soon they revert back to the north south movement, which of course keeps the sacred hoop half balanced, but still pretty wobbly. To create harmonious relationships with yourself - both inner and outer; with others; for enlightenment, and for balanced decision making the process begins with a seed, idea, or the meeting of two souls in spirit. Therefore all beginnings and births of ideas come from spirit, inspiration, or illumination, in the east of the Medicine Wheel. Then one must move to the south, the place of knowledge and the mind, to think rationally of how to go about manifesting the relationship, enlightenment or decision, and to access all the knowledge about the specific idea and whether or not it is practical to manifest the idea. Then one should move into the north of the emotions and subconscious memories, or cellular memory, associated with the task at hand. This is to balance the dry academic and doubting mind with the emotions and to access the fluid motions and inspiration needed to accomplish the manifestation of physical actions, ceremonies, tools and works of art, that are found in the west. The idea has now been manifested into a fruit, which houses the next seed, and so once again one finds oneself in the east, the place of spirit. This continuous cycle is symbolised as an infinity sign, from east to south, to north, then to west and back again to the east. Regarding fear and anxiety, the Dalai Lama in ‘The Art of Happiness’ says that if there is a solution to the problem there is no need to worry, you must act on the solution. And if there is no solution, there is no sense in worrying either. But by making sure that you mean no harm and have only good motives and compassion, you can reduce anxiety. This is being honest with oneself and others. For example, If you give a yes at first response and then change your mind, you open yourself to criticism that, “You don’t keep your commitments.” But if you say “no”, and then change your mind it’s different. I have never heard anyone say, “I was counting on you not to help me”. But to do this fully, means you must be a true warrior and be truthful to yourself; to all your emotions; and to everyone and everything else. But this is not as easy as it sounds, especially with all of today’s social duties to be kind, considerate and non-judgemental. "The tight-lipped suppression of the rigid moralist reflects it, as does the violent protest of the anarchist. But more starkly and tragically than anywhere else, it manifests in pale grey shadow of the ordinary person, whose fear clamps down on all his instincts and traps him in the narrow confines of the socially accepted norm. Afraid either to step down into the darkness of his lower self or to rise up into the light of his higher self, he hangs suspended in between, stultified into an alien pattern of nothingness." Life is like school. We move through it learning many things, cloaking ourselves in environmental knowledge. You are on the warrior’s path toward enlightenment. You must one day peel away accumulated knowledge like layers of an onion and move back into the source of your power. When contemplating a Zen garden, you find that the source of your power is the essence of the Great Spirit. We come onto this earth-walk like a giant piece of smashed mirror, every one of us reflecting the light of our God. The experience of life is a process of piecing together these scrambled fragments into one great mandala, reflecting the source of all being. Like the centre of a cyclone, we sit at the one point of stillness, the pandemonium of life circulating madly around us. Choose equilibrium, not frenzy. Live life from your centre. The essence of you and the essence of the primal moving force of the universe are one. The Zen garden promotes the process of reflection upon the outer essence of all life and the inner essentials of our existence as human beings. If you do not understand your essence, you have no power. Do not try to develop force, intent, and abilities without first understanding the primal qualities and wisdom of your essence. 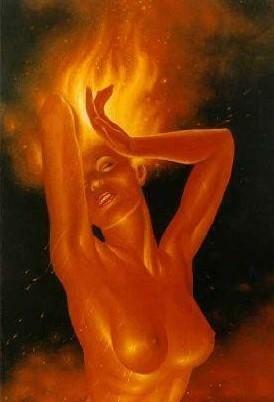 The process of discovering your essence invokes illumination.